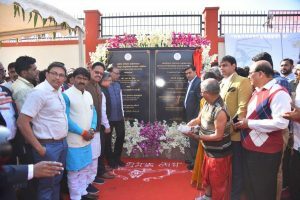 NEW DELHI: India’s Power and New & Renewable Energy Minister RK Singh laid the foundation stone of Regional testing laboratory of Central Power Research Institute (CPRI) at Nashik, Maharashtra today. The occasion was graced by Chandrashekhar Krishnarao Bawankule, Minister for Energy, New & Renewable Energy and State Excise, Govt. of Maharashtra, and the people’s representatives from the area.